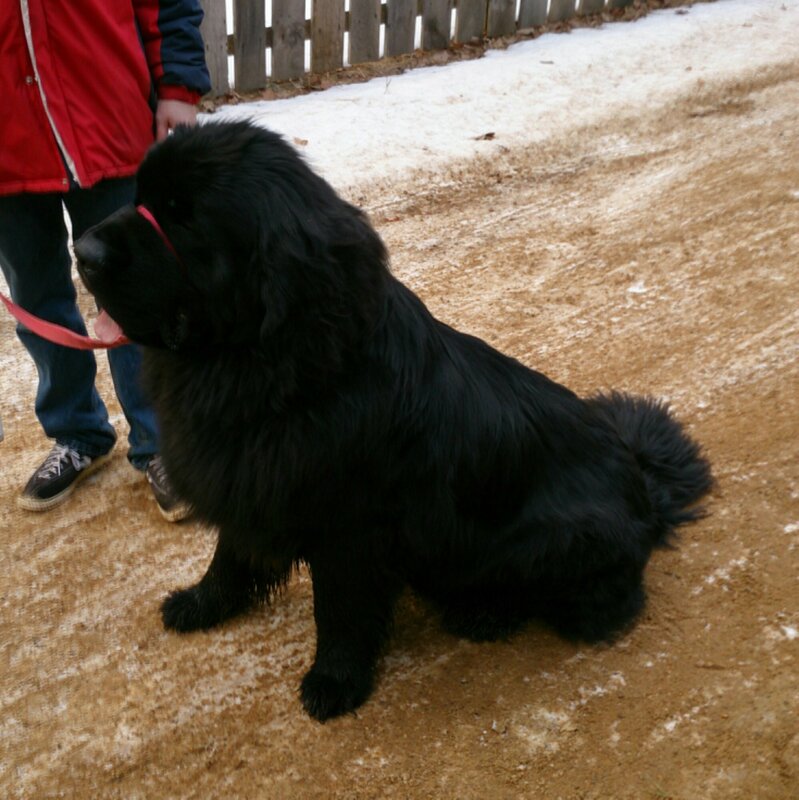 Alpha, Beta, and I went to Old Sturbridge Village this past weekend to see their Antique Sleigh Rally. Alpha is obsessed with horses so it seemed like a home run in the Dad of the Year game. Alas, Alpha bored of it in under ten minutes. Even Beta was still having fun when she announced that she wanted to do something else. Wow. At Beta’s request we made a beeline to the Freeman Farm so we could commune with the sheep and chickens. 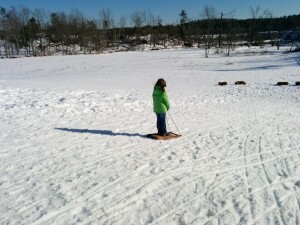 And there, behind the cooper’s shed, we found my redemption: sledding. 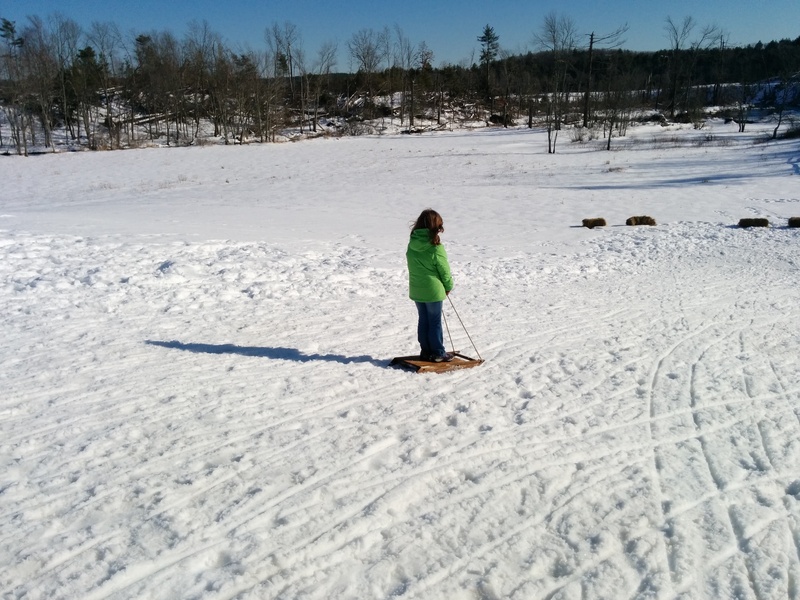 We lived a little on the wild side: both girls tried sledding while standing (pictured) as well as other orientations (backwards, in the lotus position, etc). Alpha was quite proud of herself after her first run while standing, and I was equally proud of her. Don’t tell OSV we did it, though – with no one policing the hill it was much more natural and fun. Meghan has a job with the LEGO store (yes, they insist on the all-caps spelling). She has started coming home with the big kits, thanks to her employee discount. 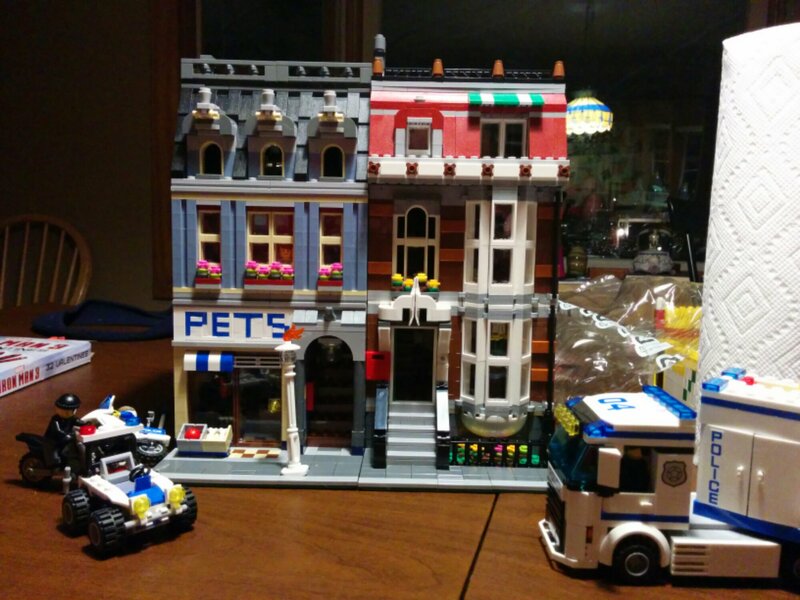 Featured here are a mobile police kit and a city shop kit. 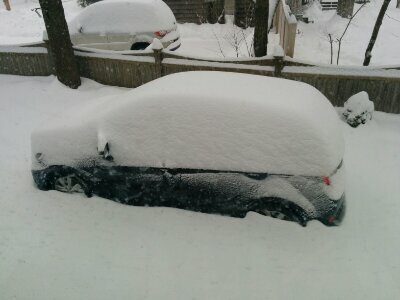 Another 7-8 inches of snow, and still coming down. 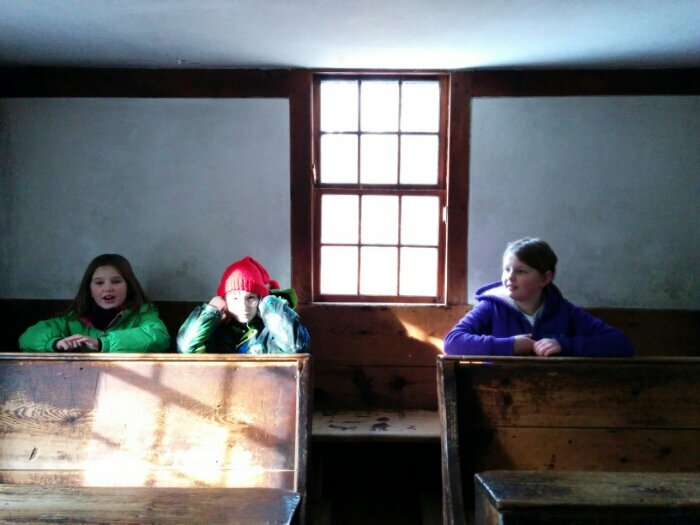 All three kids (Alpha, Beta, and Tangent) sitting in the schoolhouse for a lesson. Today, we went to Old Sturbridge Village. They do Dog Days the first weekend of the month during the winter. There were tiny dogs, medium dogs, and this pony. His name is Kloofbear’s Skipjack. Or just Skipper. If you want to drive his parents nuts, call him Skippy. Skipper looking dignified. It didn’t last. 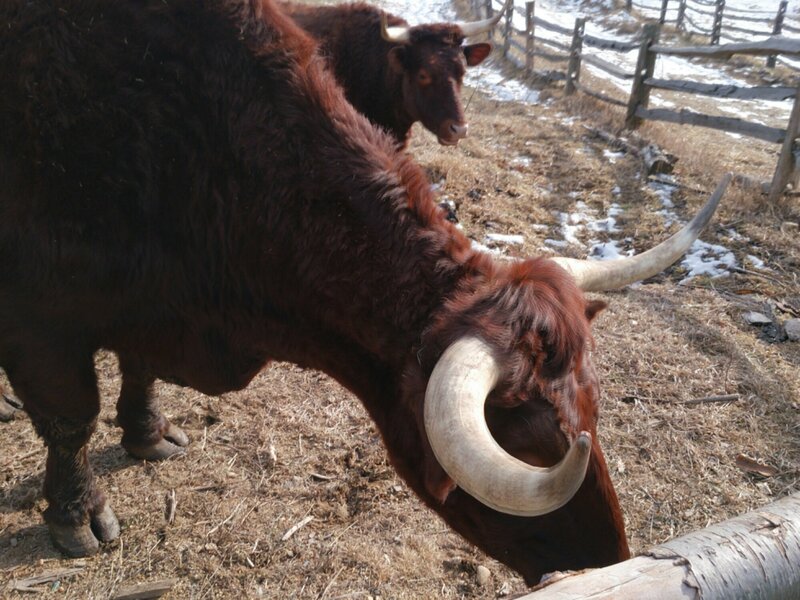 We got to spend a long time with the cows. 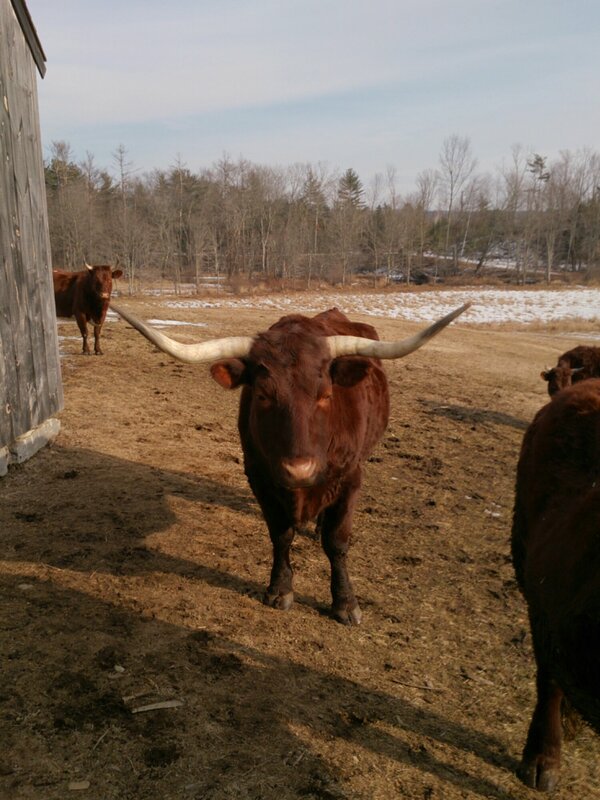 The oxen were very friendly, and the cows are just starting to show (calves due in just 6 weeks). Very fun. And, finally, at the gift shop. 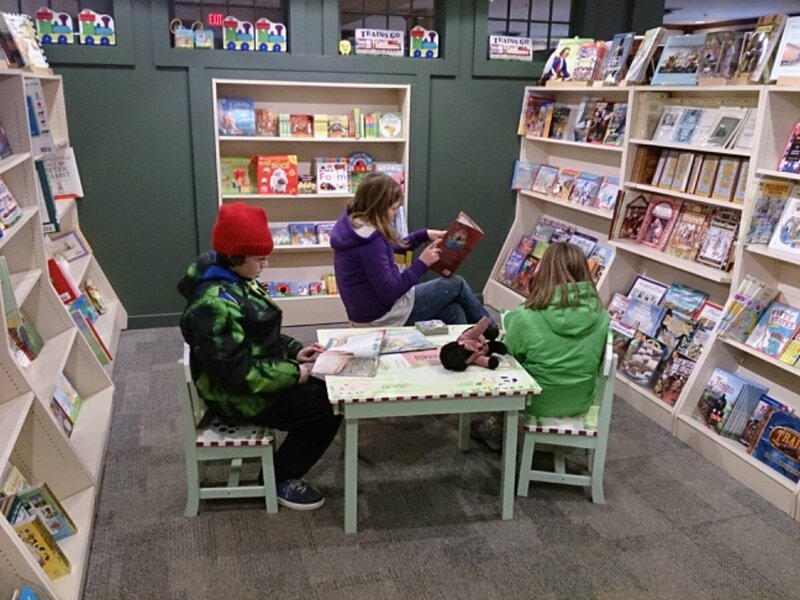 Alpha, Beta, and Tangent each grabbed a book and settled in to read. All they needed was some hot chocolate. > Beta: Do you have sprinkles? > Server: No, we don’t. > Beta: You should stock up on them. They’re awesome. nods wisely, and wanders off. Thank goodness we weren’t drinking anything, because that would have been a spit take.